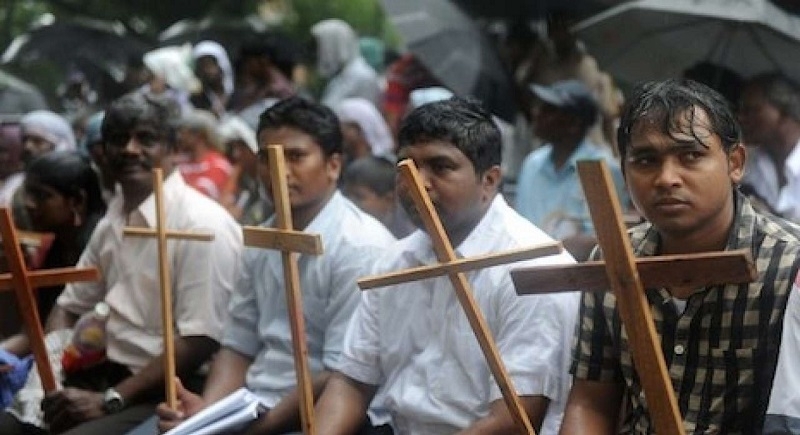 Chennai, Apr 10: Contrary to the general belief and perception that there is no discrimination in Christian faith and that all are treated with equal respect, the Dalit Christians of Sivagangai Diocese in South Tamil Nadu have alleged widespread caste-based discrimination. This startling revelation was made in a public hearing report released on Monday. The report titled “Dalit Christians Crucified” was released by Tamil Nadu Untouchability Eradication Front (TNUEF), a social organization affiliated to the CPI (M) Tamil Nadu unit on Monday. The report was prepared based on a public hearing by an eight-member committee on the alleged atrocities, including untouchability, committed against Dalit Christians in Sivagangai diocese. The public hearing was held on March 16 at R. S. Mangalam in Ramanathapuram district, under the auspices of the Tamil Nadu Untouchability Eradication Front (TNUEF) in association with Dalit Christian People Federation (DCPF), Young Tamil Nadu Movement (YTM), Caste Eradication Front (CEF), the Tamil Nadu Devendirar Council, and Devendirar Welfare Society. The hearing was held in three sessions, each focussing on a specific topic such as denial of priesthood to Dalit Christians, discrimination against Dalit Christians in the church and practised by the diocesan administration. According to reports, THUEF General Secretary K Samuel Raj said that there are two chapels and two cemeteries for the Caste Christians and for Dalit Christians in the village. They hold their festivals separately and there is discrimination in the liturgy in Sivagangai. Even the schools, colleges and hospitals run by the Church are located mostly in the Caste Christians areas and the staffs are also appointed from the non-Dalit Christians, he alleged. “Sivagangai is now a diocese that has touched the zenith of the untouchability practices in the Roman Catholic Church. Among the Catholics in this Diocese, 25 per cent belong to Devendra Kula Velalar or Pallar — a sub-sect of Dalits. Thirty years after the formation of this diocese, there is not a single soul from among this Dalit community to be ordained as priest,” Samuel Raj said, pointing out that as many as 14 Pallar Dalit Christian seminarians have been evicted from the seminary. The case of expulsion of Michael Raja, a Pallar Dalit seminarian, at the fag end of his theological course and training has become a rallying point for the Dalit Christians, said D Hariparanthaman, a retired Madras High Court judge. “I along with five other seminarians was expelled from St Paul’s in 2011 for throwing microphones in the water. Even after one of the brothers confessed to his mistake, the expulsion of five others was not withdrawn,” said Raja. “There are 150 priests in the Diocese of Sivagangai but not one from his Pallar Dalits,” he said. The report was released by retired Madras High Court judge Justice D. Hariparanthaman and former Vice-Chancellor of Manonmaniam Sundaranar University V. Vasanthi Devi, who were part of the team that conducted the public hearing. The report alleged that the practice of caste can be found in the formation of parishes, denial of the share for the Dalit Christians in the administration of the parish, construction of separate chapels in the same village for Dalits and other caste Christians, discrimination in the facilities provided based on caste considerations, denial of employment opportunities and priesthood for Pallar Dalit Christians. The report said that the Dalit Christians are subjected to various types of caste discrimination and untouchability and the diocese administration acts in a discriminatory manner in forming the new parishes by confining more Dalit Christians in less parishes and making more parishes for caste Christians with less members. The report also provided recommendations on how to remove practices of untouchability and caste discrimination. “Practices of untouchability, discrimination and exclusion be forthwith abolished and special attention be given at all levels for the promotion and care of vocations to priesthood and religious life from the Dalit community. There should be participatory and inclusive administration and transparency in governance of church bodies and parishes and liturgical and para-liturgical concerns of the Dalits should be attended to. Special interest should be taken in the formation of the Clergy and Religious,” the report added.